The girls’ room power tripped more than 10 times during the night. They complained they shouted for help but only the dogs in the city howled in response. 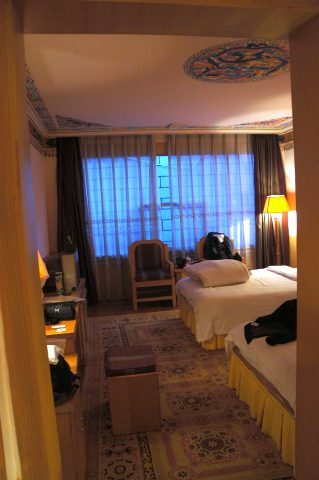 Well, our rooms were quite a distance apart and the television probably drowned their voices. Sorry! After breakfast in our rooms, Dawa and driver picked us up in a 4WD Toyota 4500. 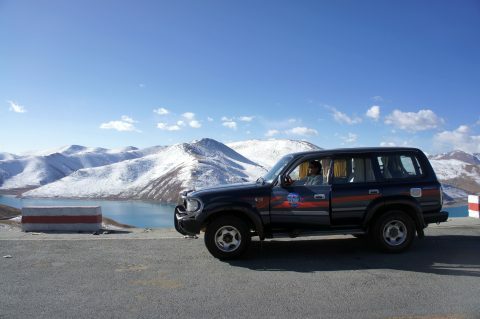 We would be doing a return overland trip across Tibet from Lhasa to Gyantse, Shigatse and EBC during the next few days. 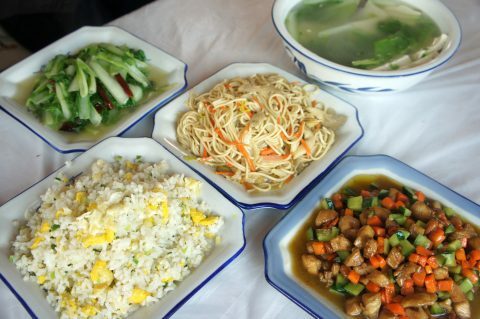 Today, we would be passing through Tsang region via the Southern Friendship Highway. Our first stop for the day was a very scenic lake. 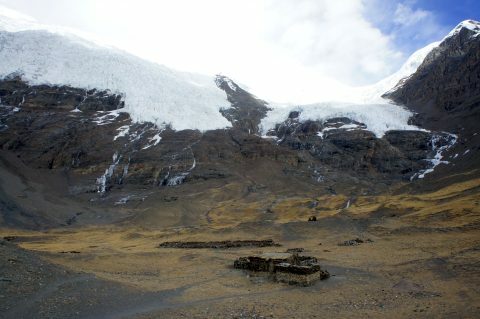 I couldn’t really remember if it is part of Yamdrok-tso. 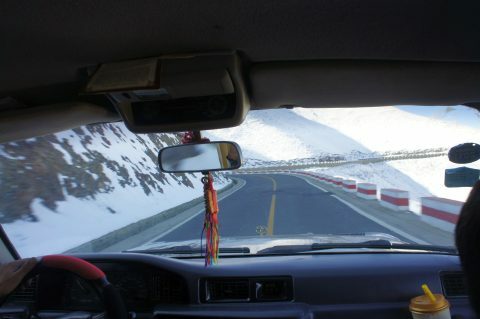 We continued our drive to Kamba-la (4700m) for a bird-eye’s view of Yamdrok-tso. 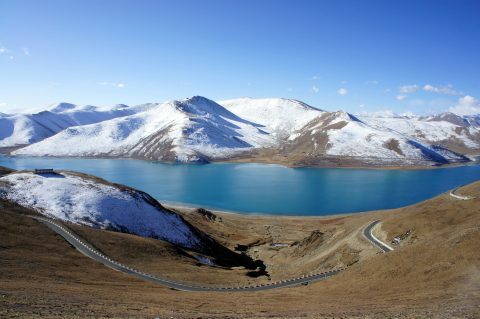 Ahh, breathtaking scenery of turquoise blue lake with snow-capped mountains. 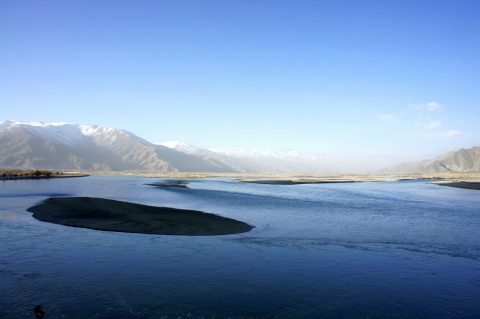 The coiling scorpion shaped Yamdrok lake is almost the size of Singapore and can be circumambulated in around seven days by pilgrims. 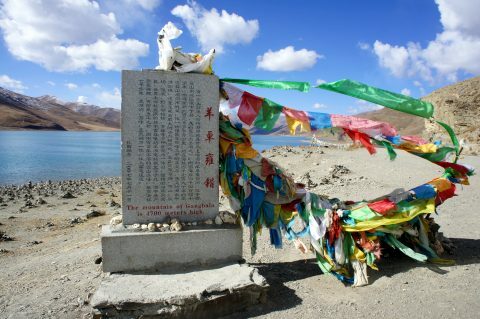 Yamdrok lake is one of the four holy lakes in Tibet. 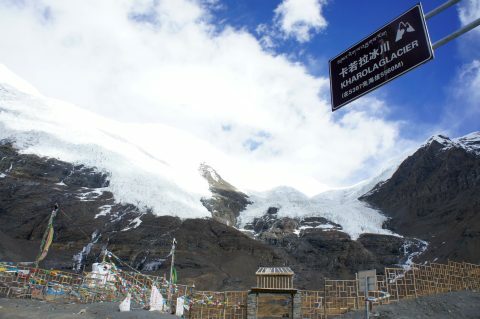 The other three are Lhamo La-tso, Namtso and Manasarovar. 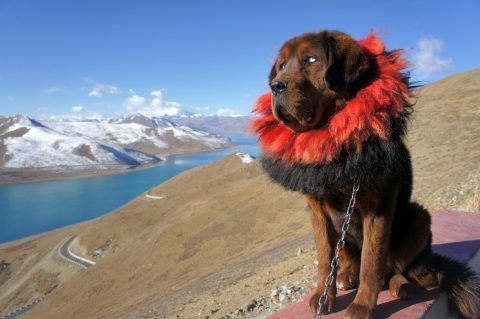 Photo opportunities with well-adorned Tibetan Mastiff and Yak at Kamba-la. Somebody attempted to charge us after we took the following photo. Dawa reasoned they should have put a sign to indicate that photography is chargeable. We didn’t pay in the end. We continued our way to Nangartse town for lunch. Next on the itinerary was Kharola Glacier. 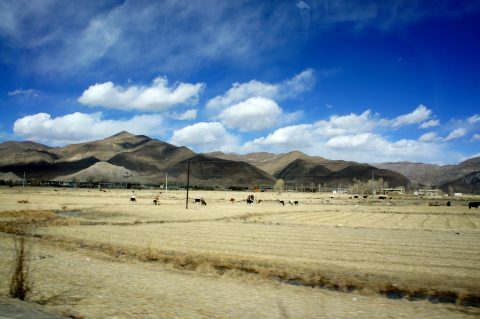 Way to Gyantse (3980m). These seem like very nice roads to ride a motorcyle. When Sim’s Cozy arranged our trips, they have to specify the sites we were going to visit. Gyantse Dzong wasn’t on our list so we just took a photo outside the fort. 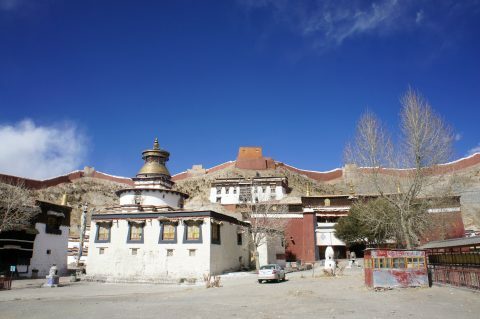 Now, Gyantse Pelkor Chode Monastery was part of our itinerary. 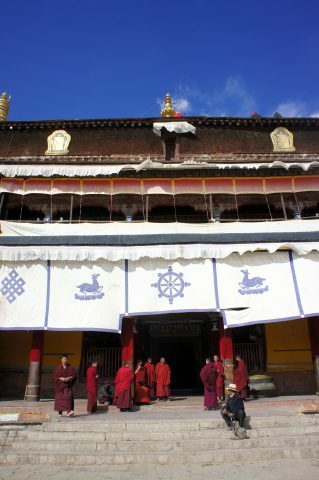 Pelkor Chode was once a site of multiple monasteries from different orders of Tibetan Buddhism which included Gelugpa, Sakyapa and Buton. 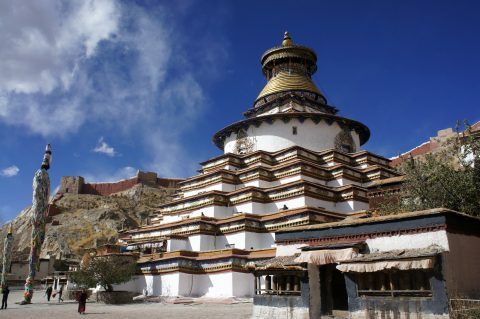 The Gyantse Kumbum is the most striking architecture in Gyantse. 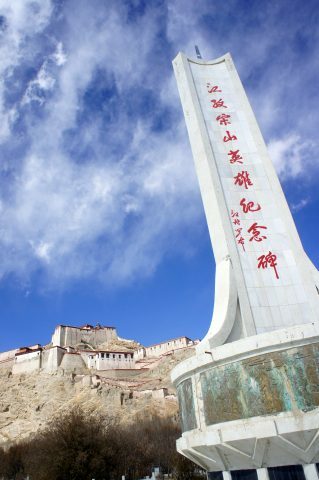 Standing at around 32m tall, it is considered to be the largest and most important Kumbum in Tibet. Note that Kumbum literally means one hundred thousand holy images . 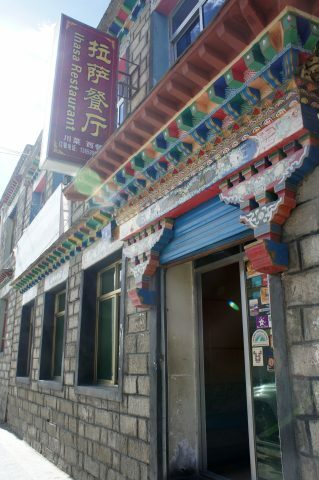 We hurried on to the Shigatse permit office only to find out that they were temporarily closed for a meeting. 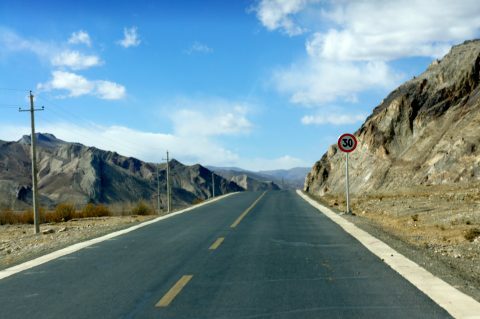 There seem to be a fair bit of paperwork involved for a tourist group to move around Tibet. In any case, we waited in the car until the office finally opened and Dawa was able to get the necessary papers. 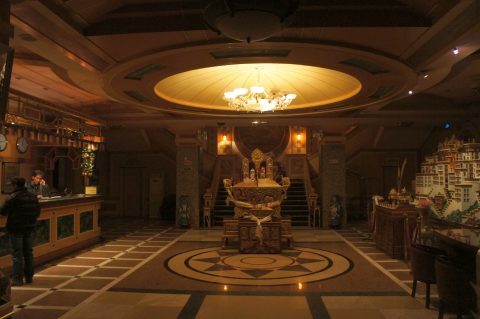 The night was spent at Manasarovar Hotel in Shigatse. 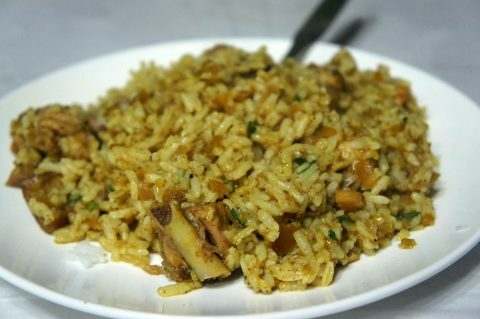 For dinner, we visited the popular Songtsen Tibetan Restaurant. 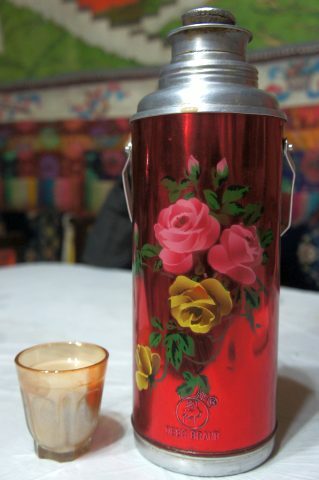 Instead of butter tea, we had sweet milk tea. 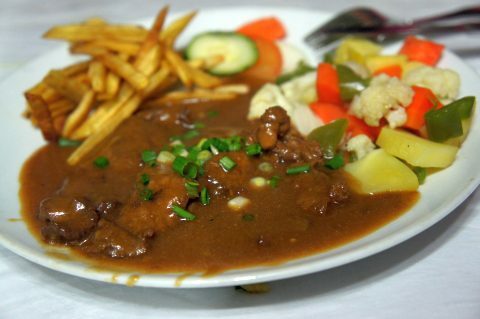 The dishes we ordered were excellent and the staff at the restaurant spoke fantastic English. The Tibetan Mastiff was actually dripping mucus. It’s must be cold for him. 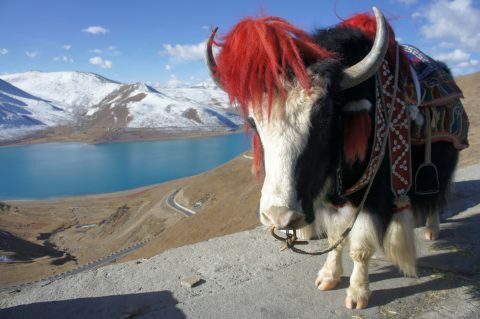 About the Yak, I read that they can have a variety of coat colours ranging from black, grey, white and brown. 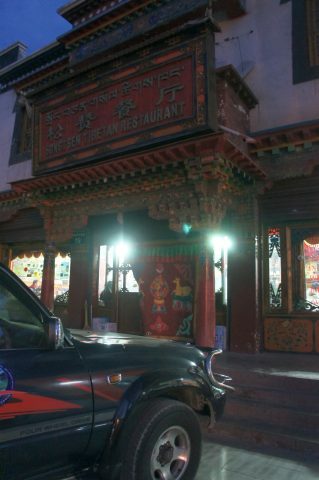 Yep, the Gyantse Kumbum can be visited.